The incident goes back to the year 2014, when Dr. Bhatia went on a trip to Hong Kong. As per an earlier report in DNA, Dr Bhatia’s tour expenses including flight ticket and lodging and boarding, were paid for by M/s Stryker India, a company which manufactures implants. The right thing was he should have sought a “no-objection” from the government, which is mandatory for a doctor in a government hospital. To evade that rule, Dr Bhatia assumed the identity of a consultant of Primus hospital, thus misrepresenting facts, leaving him open to the charge of impersonation, added the media report. “Both Dr. Bhatia and one of the complainants appealed to the MCI. While Dr. Bhatia said his punishment was too harsh, the complainant maintained the DMC was too lenient. The MCI ordered that Dr. Bhatia not be allowed to practice for one year and that has been brought into action,” Dr. Tyagi told the Hindu. In dealing with Pharmaceutical and allied health sector industry, a medical practitioner shall follow and adhere to the stipulations (Travel facilities)- A medical practitioner shall not accept any travel facility inside the country or outside, including rail, air, ship , cruise tickets, paid vacations etc. from any pharmaceutical or allied healthcare industry or their representatives for self and family members for vacation or for attending conferences, seminars, workshops, CME programme etc as a delegate. Wat about MCI getting sponsored n talking money for renewal? Wat about reinstating the former corrupt mci inspector? SUCH DEVILISH DEALS OFTEN TAKES PLACE IN CLOSED CHAMBERS OF THE BABUS THE BUEROCRATS..( THEY ARE BLESSED WITH IMMUNITY FOR LIFE TIME). 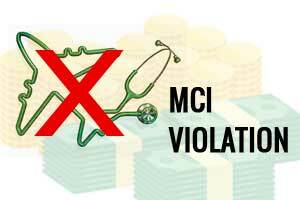 This whole punishment and MCI hypothesis is based upon presumption that if a doctor is sponsored he will b forced to use products of that company in irrational manner. It has never been validated. Punish those who r found using products unehically (but for that onus will b on MCI etc as they have to wrk and not act like demigods take the shortcut and let doctors keep on cry as nobody iis going to listen because we they r undivided lot and it serves importance or Ny equivalant body to boss around.